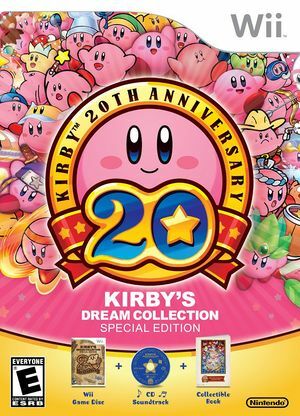 Kirby's Dream Collection is a game for the Nintendo Wii, released in 2012 to commemorate the 20th anniversary of the Kirby series. It features 3 modes: a set of challenge stages using the same technology as Kirby's Return to Dream Land, a playable set of older Kirby games (Dream Land, Adventure, Dream Land 2, Super Star, Dream Land 3, and 64: The Crystal Shards), and a museum mode, which provides information on both Nintendo and the world throughout the years. Kirby's Dream Collection is capable of using both GameCube controllers and Wii Remotes. If a physical controller is set to emulate both a GameCube Controller and a Wii Remote concurrently, it will operate both devices at the same time. To fix, migrate controls to use separate physical controllers. Wii remotes disconnect after choosing a classic title, they can be reconnected. This behavior also occurs on the Wii. Kirby's Dream Land 3 requires a Texture Cache Accuracy setting other than Fast to prevent graphical redraw issues (e.g. cursor selection on pause screen). Corrected via INI update prior to 5.0-6309. Kirby's Adventure handles Internal Resolution oddly. When using x1 native resolution the display is slightly blurred, this blurring is significantly increased with any even, higher IR. Odd IR seem to reduce or eliminate the blurring. Any anti-aliasing causes visual artifacts in Kirby's Adventure. 2x or 4x MSAA or SSAA will darken the image in Kirby 64: The Crystal Shards (8x is safe). The graph below charts the compatibility with Kirby's Dream Collection since Dolphin's 2.0 release, listing revisions only where a compatibility change occurred.